Successfully Added VKworld VK800X Android Smartphone - 5 Inch IPS Display, Android 5.1, Quad Core CPU, Smart Wake, Dual SIM, 2200mAh (Silver) to your Shopping Cart. This entry level phone comes with everything you need encapsulated in a superb design and has an unbeatable price making it a star of the budget phone lineup. Powered by the popular Android 5.1 lollipop the VKworld VK800X you can benefit from tighter security, an enhanced notification system and improved battery management. Under the hood you get a quad core 1.3GHz CPU and 1GB of RAM for high speed processing that will happily keep you entertained with games and movies as well as managing your multitasking needs. With Smart Wake you have quick and easy access to the most common functions by just drawing character on the locks screen. A ‘C’ will open up the camera and ‘M’ will bring up you music player making for an intuitive and fun interface. Cameras functionality if often overlooked on budget phones but that's not the case with the VK800X. It sports an impressive 8MP rear facing camera and a 5 MP front shooter. With a range of camera modes and front and rear LED flash you won’t have to worry about insufficient light for your selfies and can enjoy a better low light performance from both cameras. 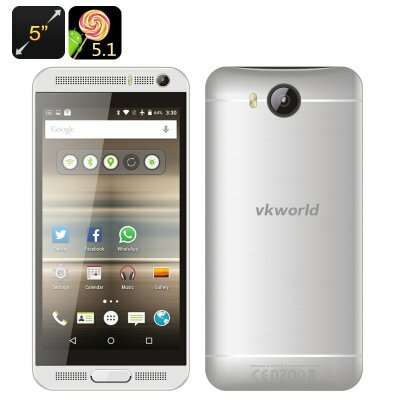 The VKworld VK800X Smartphone comes with a 12 months warranty, brought to you by the leader in electronic devices as well as wholesale Android smart phones.. Very good product for this price!!! Very fast shipping! !